Specializing in high-quality and precision diamond tooling that's custom-made to your exact specifications. When Sidley Diamond Tool Company came into existence in 1956, we knew the needs of the industries we supplied were ever-changing. Our engineers have kept that in mind over the years and focused on progressive change and innovation. Sidley is fully computerized with CAD, and our systems are able to communicate with most computers via IGS files. It is this communication that has allowed us to maintain our reputation as a premier supplier in the industry. In our manufacturing department, experienced machinists use the most up-to-date production inspection equipment to ensure an accurate finished product. By using electronic gauges and optical comparators that achieve up to 100x magnification, tolerances as low as one ten-thousandths of an inch (.0001) can be achieved. By using strip chart recording up to 100,000x magnification, tolerances as low as one ten-millionths (.000010) of an inch have been obtained. The Sidley Diamond Tool manufacturing department works in tandem with our engineers to ensure both high-quality standards and customer satisfaction. 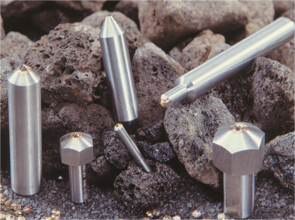 Sidley diamond dressing tools manufactured with our unique process can perform up to five times longer than conventional diamond tools. These tools can be manufactured to physically duplicate your current tooling. We can manufacture in virtually any shank or configuration; there is no need to adjust your current operating parameters. Just use our tools in place of your current tools and experience the many benefits of Sidley's quality! Through these methods, we are continuously improving our products. This quality program system is used to maintain Sidley Diamond Tool’s enviable reputation for exceptional quality throughout our 60-year history and beyond. Who Uses Sidley Diamond Tools? Contact us today to discuss your needs with a member of our team and get a custom quote for your tooling. Our catalog features detailed breakdowns of our precision products. The contents of this webpage are Copyright © 2019 Sidley Diamond Tool Company. All Rights Reserved.